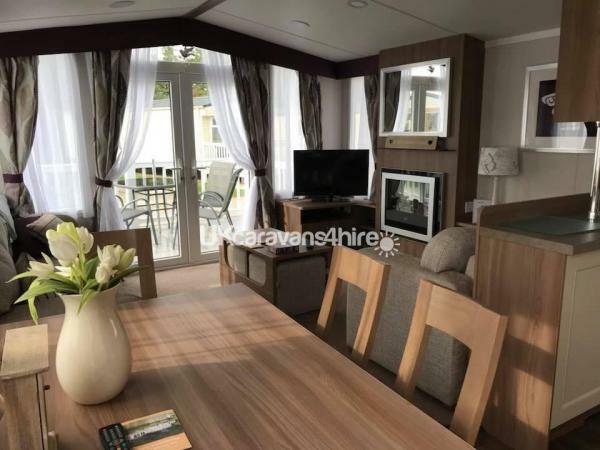 Our beautiful Prestige Static Caravan is available to rent on Haven, Thorpe Park, located in Cleethorpes. 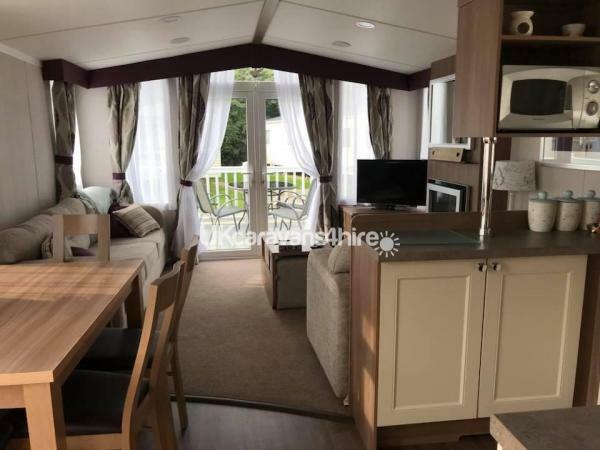 Our 2018 38x12 Swift Bordeaux has 3 bedrooms and is an 8 birth caravan. Please see pictures of the inside of the van. 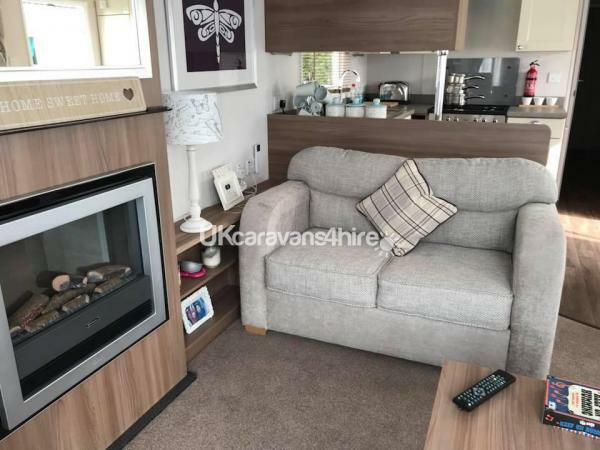 Patio doors are located on the front with veranda decking and seating area, and comes with full double glazing and central heating throughout. The lounge has two sofas, a 2 seater and a 3 seater sofa with fold out bed in a cream fabric style. 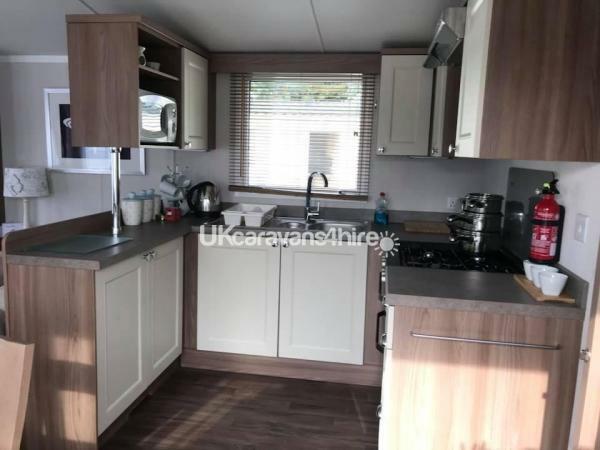 There is a U-shaped kitchen which has matching cupboards below the grey, 40mm deep worktops and have matching upstands with the wood effect throughout the van. All cupboards have soft close hinges and the cupboards have chrome effect handles. The 4-burner gas hob has a discrete extractor fan which vents externally, plus a gas oven and grill, while there is also an integrated fridge freezer and microwave included too! Set just off the kitchen is a free-standing table and chairs. 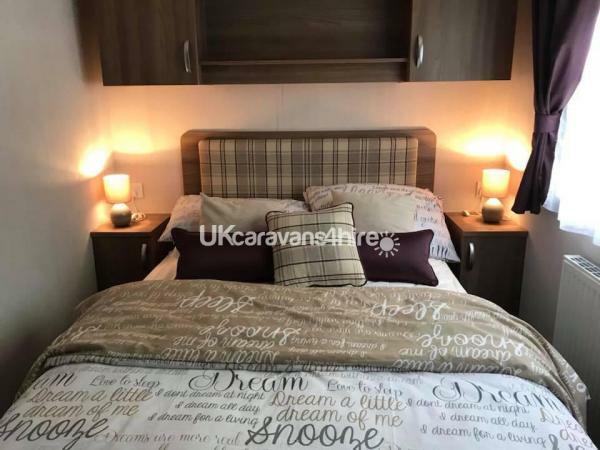 The set comes in the same wood effect to match throughout the van and is a lovely dining suite which provides a great space to spend meal times together as a family. Bedrooms are made up of one double room and two twin rooms. The master room has a double bed with lift up storage. There are bedside cabinets with panels and over-bed storage. Again, you have chrome effect handles, which match the curtain poles. There are over-bed reading lights, and under locker LED strip lights meaning you can adjust the ambience as required. 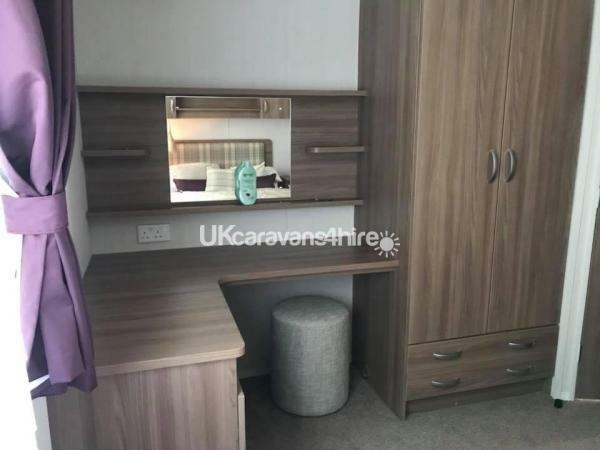 There is a vanity area with mirror and socket, plus plenty of wardrobe space. The twin rooms are styled to match the main room, where you have two single beds, with a bedside cabinet in the middle, over-bed storage and a tall wardrobe in each room. In the family shower room, there is a wash basin, with additional shelving above, including a mirror. There is a dual flush WC, large shower enclosure and an extractor fan. 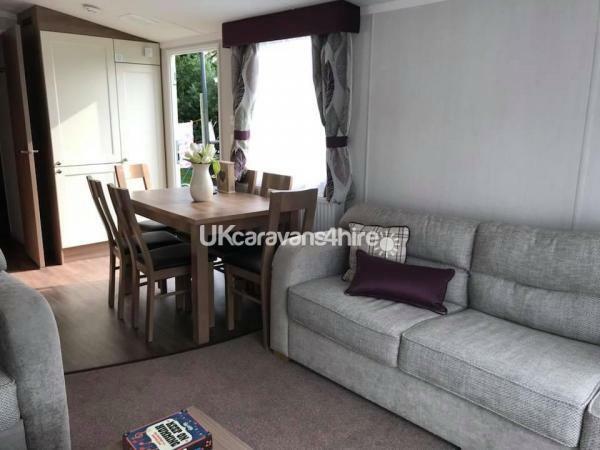 This makes a superb, modern and contemporary styled holiday home which will be ideal for a families, it offers luxury and home-from-home comforts so you can maximise your holiday time. Thorpe Park Holiday Centre. Thorpe Park caravan park has what it takes to make the whole family happy. If you're looking for thrills, spin around and down the Space Bowl flume in our outdoor pool, or float along the lazy river. Make your tummy flutter with our bungee trampolines, zip wire or the daring Leap of Faith. But when it's time to chill, what could be more relaxing than a peaceful hour or two fishing on a huge lake? Maybe a round of golf on our 9-hole course, or just a little pitch and putt. Or just slip away to the miles of sandy beach. Thorpe Park is a great destination for water lovers. As well as our regular water activities like Aqua Gliders, Water Walkerz and Learn2Swim we have the Space Bowl flume and SplashZone. If you would rather head for the skies there's the Leap of Faith and our climbing wall to take on. From Pop-up Puppet Theatre for the kids through to bingo and sing-alongs, we have entertainment for every generation and every taste. The action starts early with the Seaside Squad and runs right through to the evening shows. Our super talented FunStar Cast are here to keep you entertained day and night. Hand-picked professional dancers, singers and hosts will perform in our top music productions and quiz shows to keep the whole family entertained. We have some great new acts for 2019 including Pop-up Live! and Musikids: School's out! Our park is jam-packed full of facilities for your fun and convenience from sports and play areas, to bars and restaurants where you can enjoy a nice drink and a yummy bite to eat. Grab a pool noodle and head to our recently refurbished indoor pool. We've upgraded the changing rooms, linked it to the outdoor lazy river and added some extra features. We also have shops and markets right on your doorstep, so don't sweat it if you leave something at home, we've got you covered. You can head to see the seal pups at the Seal Sanctuary in Mablethorpe. You can then head across to the Lincolnshire Wolds in Lincoln and visit the famous cathedral. Or tickle your taste buds at nearby Louth Farmers' Market.A long, calm stretch of easily accessible coastline fringed by endless sandy beaches - no wonder a handful of Britain's most traditional seaside resorts are here. 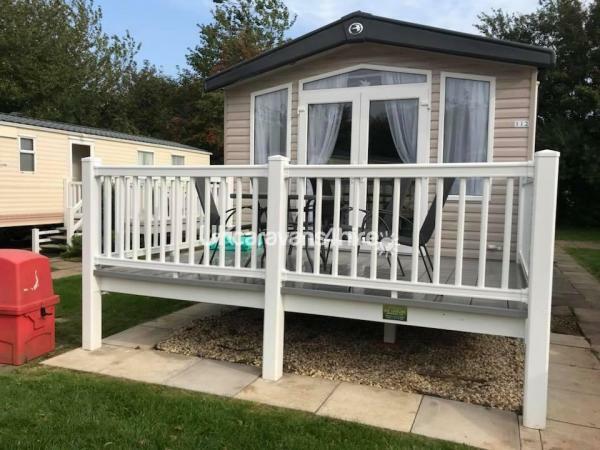 Our Caravan is situated in a wonderful part of the country with lots to see and do both on Thorpe Park and in the surrounding areas of Cleethorpes and Lincolnshire. Whether its fun and excitement for all the family or just a relaxing chill out time you are sure to find what you want here. We have lots of dates available to rent out our van. Please contact us for availability throughout 2019 and prices! No reviews found. If you have recently stayed in this holiday home please leave a review, it only takes a few moments and will really help future guests when they are searching for holiday accommodation at Haven Thorpe Park.